If you enjoy this article, please share it on your favorite social media platform or save a copy to your device. 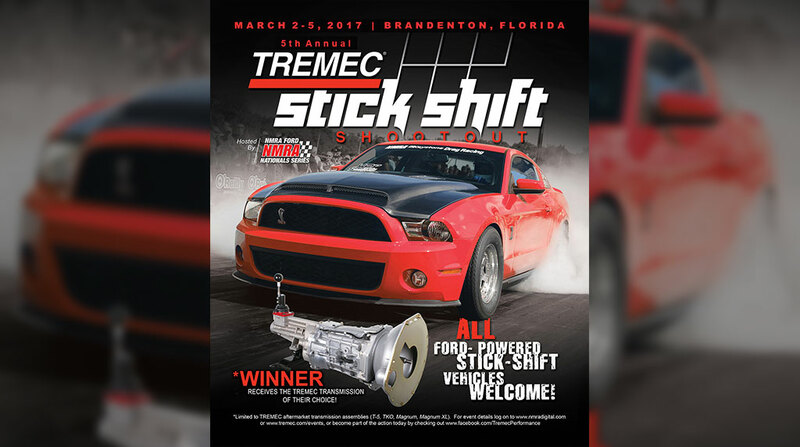 We are proud that the TREMEC Stick Shift Shootout is returning to the 2017 Nitto Tire NMRA Spring Break Shootout, March 2-5, 2017, at Bradenton Motorsports Park in Bradenton, Florida. The four quickest True Street cars will compete in a single-run elimination called the TREMEC Stick Shift Shootout. The winner will receive a brand-new TREMEC transmission of their choosing. After the True Street competition concludes on Saturday, March 3, TREMEC will host a Racer Appreciation Party before the awards ceremony. True Street class is the most popular series in The National Mustang Racers Association (NMRA) racing, with 100 cars competing at its largest events in the nation. Open to legitimate street-driven Ford vehicles that are also Ford-powered, True Street is a class for everyone, from novice racers to seasoned quarter-mile veterans. If you want to learn more about the True Street class and how to enter, visit nmradigital.com/true-street/. The rules for the TREMEC Stick Shift Shootout are simple: Only H-pattern-shifted manual-transmission-equipped cars may compete, but modifications such as face plating and pro gears are allowed. Transmissions must be operated by a single shifter handle; air/electric/hydraulic actuation or multiple shift levers are not allowed. With the True Street turnout for Bradenton expected to be more than 120 cars, the competition should be as exciting as it is diverse. Word has it that the winner and runner-up from the Stick Shift Shootout at the 2016 NMRA World Finals at Bowling Green, Kentucky, will compete at Bradenton this year. True Street competitor Anthony Heard is also slated to debut his recent 1999 Cobra build at the Spring Break Shootout. The rumor mill is churning about some other new car builds that will be showing up, including a 331-cubic-inch pushrod V-8 turbo car! Don’t miss out on all the excitement at the 2017 Nitto Tire NMRA Spring Break Shootout and the TREMEC Stick Shift Shootout! But if you can’t make it, be sure to check back here on TREMEC blog and Like the TREMEC Facebook page for updates and photos from the event.